Cardamom might be the most underappreciated spice out there. Sure, it’s expensive, but not, like, saffron expensive. And a lot of people think it’s this incredibly exotic, inaccessible Indian spice. Exotic? Perhaps. Inaccessible? Pshaw! It has the most amazing perfume, but not overpowering. I made these muffins following Dorie Greenspan’s recipe for allspice crumb muffins (from Baking: From My House to Yours), subbing the cardamom for the allspice. They were a big hit, and I suspect if I had used cardamom that wasn’t a bazillion years old (such as, freshly ground! ), they would have been even more scrumptious. They’re very easy, so make them this weekend! Prep: Preheat the oven to 375 degrees F. Butter the 12 molds in a regular-size muffin pan or fit the molds with paper cups (or use ungreased silicone muffin pan without paper cups). Place the muffin pan on a baking sheet. Streusel: Combine the flour, brown sugar and cardamom in a small bowl. Add the bits of cold butter and toss or cut in with a pastry cutter to get irregularly shaped crumbs. Refrigerate until muffins are ready. Muffins: In a large bowl, whisk together the flour, sugar, baking powder, cardamom and salt. Stir in the brown sugar, braking down large lumps. In another bowl, whisk the melted butter, eggs, milk, and vanilla together until well combined. Pour the liquid ingredients over the dry ingredients and, with the whisk or a rubber spatula, stir gently but quickly. Add the lemon zest. The batter will be lumpy. Divide the batter evenly among the muffin cups. 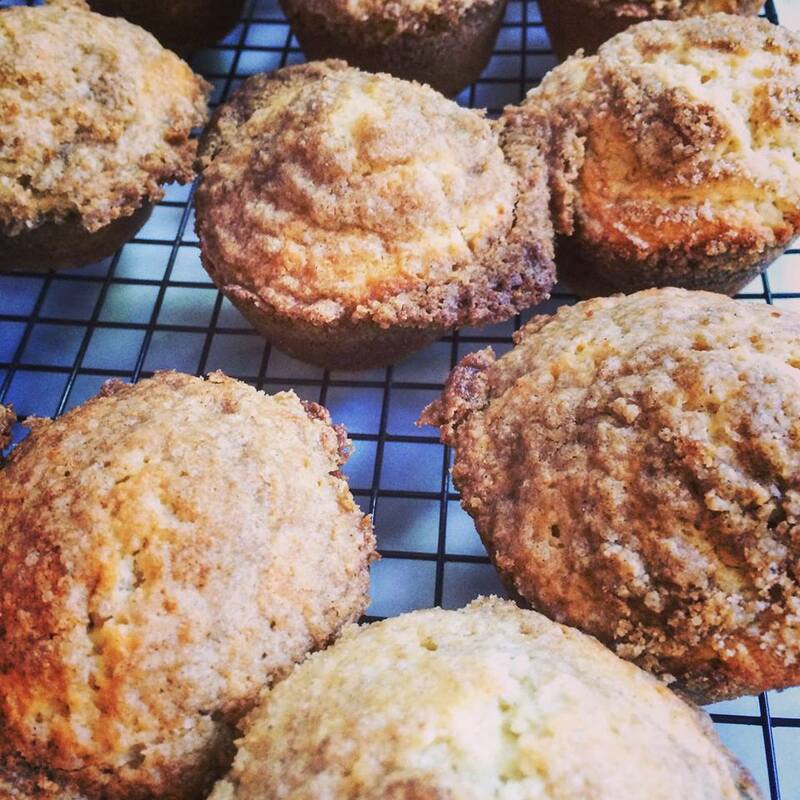 Sprinkle some streusel over each muffin, then gently press the crumbs into the batter with your fingers. Bake for about 18-20 minutes, or until the tops are golden and a toothpick inserted into the center of the muffins comes out clean. Cool on a rack for 5 minutes. Carefully remove the muffins from the pan.